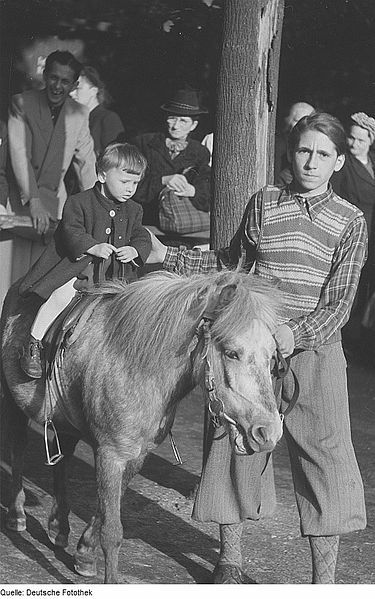 Thank you to Deutsche Fotothek and photographers Roger and Renate Rossing for this picture of a kleine kind auf einem pony reitend (little child on a pony ride). Do you think the smiling man on the left is the proud papa? And do you think he rides as well? Well, you might have to get yourself an Arabian first. They’re so wonderful with children (and we know you need one for yourself, too). One of my favorite photos is of me at 2 on a pony ride. My mother is smiling, but it must have snapped at JUST the right time. She’s scared to death of horses. I was addicted since I can remember, but she managed to keep me away from them (for my own safety, of course). I started to ride as an older adult when I could finally support me and a horse. Passion overcomes fear, and even though my mother won’t come near my horse, she’ll at least look at pictures of him. And I remind her that he is my dream come true. Congratulations on making your dream come true. Horses have a way of doing that, don’t they? Thanks for sharing here! Please come back and share some more.